If a class has met its maximum enrollment number, Jackrabbit can maintain a Wait List of students who would like to enroll if an opening occurs. 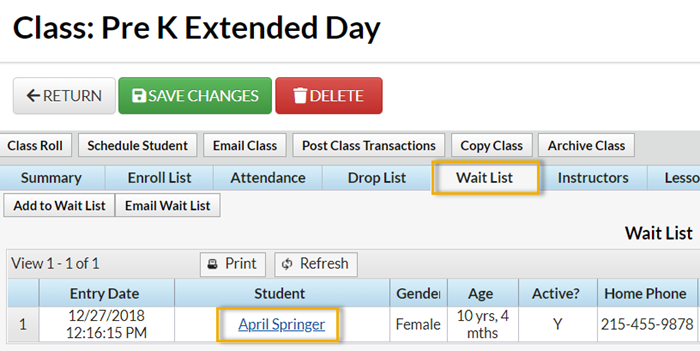 The Wait List for a class can be viewed by clicking the Wait List tab in any class page. Each class should have a maximum enrollment number (MaxSize) and a maximum number of students that can be added to the Wait List (MaxWait). Students may not be added to a Wait List until the MaxSize has been met. Students may not be added to the Wait List if MaxWait has been met. 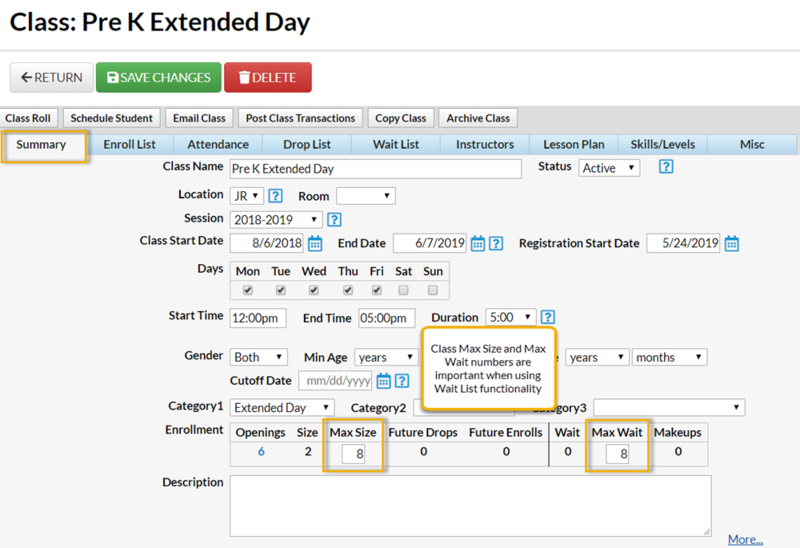 If a class is full (has met its MaxSize number on the Class Summary tab) and has availability on its Wait List (MaxWait on the Class Summary tab), an organization can choose to add students to a wait list. If an opening becomes available, students can be enrolled to the class from the class' Wait List. Ensure you are in the correct Class. Ensure that the Class MaxWait has not already been met. Click the Wait List tab. Click the Add to Wait List button. In the Class Enroll pop-up box, search for the student to add to the class wait list. Once the student has been located, select the Wait List link beside the Student's name. When prompted, Add this student to the Wait List?, select OK. When prompted, click OK again. If necessary, click the Close link (far right upper corner) to close the Class Listings page. The student is added to the Wait List tab of the Class.